San Vicente Boulevard immediately south of Wilshire Boulevard. We dedicate the planting of these 100 trees on this date as part of a beautification project in honor of J. Harvey McCarthy, a pioneer in the field of urban planning, who developed Carthay Circle as a cohesive residential community in 1924. That our neighborhood continues to prosper and maintain its residential character is a living tribute to his vision. Principal sponsors: Cadillac Fairview Corporation, Carthay Circle Homeowners Association. In gratitude for the support and cooperation of Councilman Zev Yaroslavsky and staff/City of Los Angeles Street Tree Division. 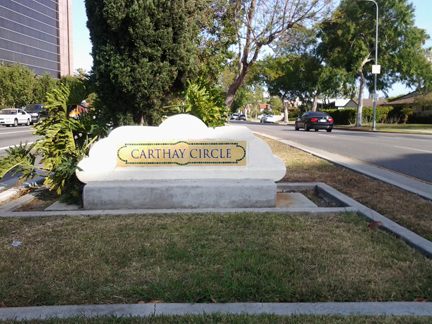 Carthay Circle Homeowners Association Beautification Project Cochaired by Chris Appel & Carole Villasenor July 11, 1987.